The Campaign For Real Ale (Camra) says 12 pubs are closing across England, Scotland and Wales every week. The consumer group says the figure, up to the end of March 2012, is a drop on its previous findings. 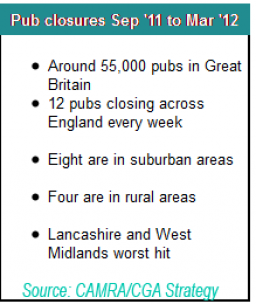 Despite the fall, Camra is concerned about the number of suburban and rural pubs shutting for good. “It’s encouraging to see it slowing down but behind that figure we’ve seen 4,500 pubs close since 2008,” said Camra’s Chief Executive Mike Benner. “It’s certainly not good news.” “Going to the pub is increasingly becoming an unaffordable activity,” said Mike. “A third of the price of every pint you buy is now taxation. Excise duty on beer has increased by 42% since 2008.” Blames for the rate of closures are the recession, the tax on beer being too high and supermarkets selling alcohol cheaply. Camra wants to see a halt on above-inflation beer tax increases and has launched an e-petition. ( View and sign here ) The Government says they are taking action to support pubs. “We have doubled small business rate relief for two and a half years, which gives up to 100% rate relief for small firms including pubs,” said Communities Minister Bob Neill. Our aims are simple, to help and support any pub in our area that might be closing down. This can be done in a number of ways. 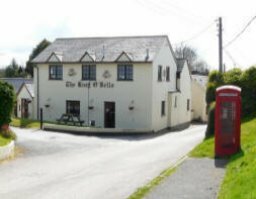 Promoting the use of your local pub, and encouraging a good community spirit. Campaigning against closures through local councils, authorities and MPs. Publicise with local media and encourage high profile coverage. Encourage local community groups to campaign for their local pub.